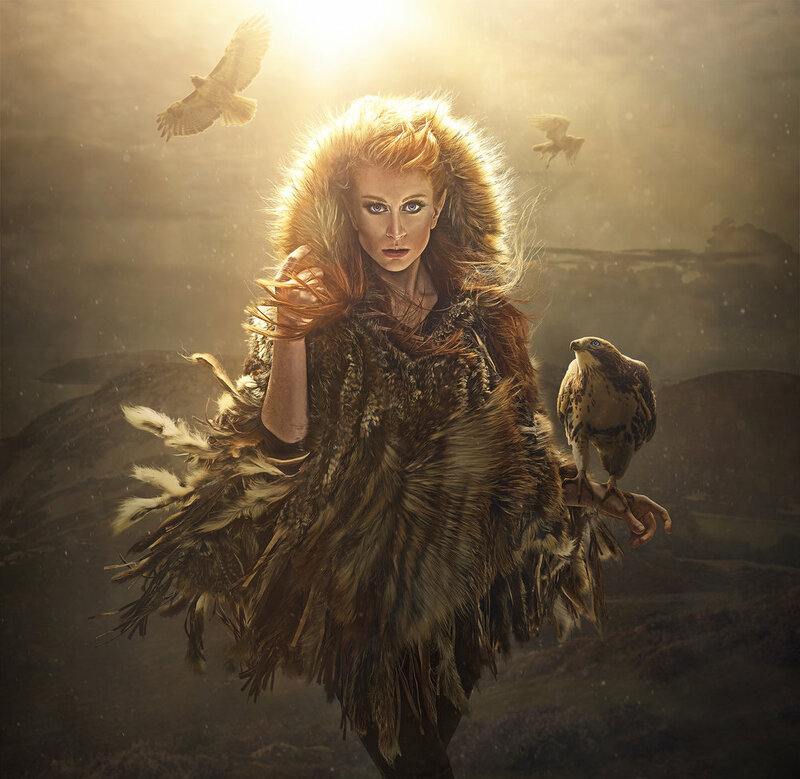 “The Falconer,” featuring Shelby Robinson. Check out her fantasy work and also her stunning portraiture! Have you ever had a client shoot where they really wanted a picture done a certain way, and you just knew that it would look better if you did it a bit differently? Or like, entirely differently? Well, the trouble with clients is that they’re the ones signing the check at the end of the day, and if they are not pleased with what you did … you might just not get that John Hancock. Obviously, as we all know, the customer is always right … even when they are wrong. SO, I’ve learned a fancy trick (it’s not fancy) where I shoot until the client is happy, (hooray happy client!) and they feel they have the images they want, and THEN if I have the time, I’ll do it my way. I mean, you already have the lights set up, the camera is on, and depending on the shoot, there is very often a lovely model already dressed and styled with top notch hair and makeup (feel free to go stalk my amazing friend Red who did the HMU for this shoot! ), so why not just snag a couple images for yourself? If you know you’re going to be editing these images for the client and in the end always look at them and be like, “Yeah they are fine, I like them, but I just know there is this other shot that I’d really love for my portfolio,” THEN GET YOUR SHOT!! Later you can show “your” finished shot to the client and they might finally be able to see your vision (as they couldn’t seem to in their own heads), realizing it is indeed superior. They might just end up using your idea instead - because let’s be real, you are the artist here, and you were totally right about everything. (Sorry clients.) If they can’t be swayed from their original plan, no harm no foul. You also shot it how they wanted it, so just hand that over, collect your check, and go to town editing your own image with your own ideas for your own portfolio. Huzzah! To take this idea a little further - so long as it does not interrupt the shoot you are being paid to do, or throw off the whole schedule - it’s totally cool to squeeze in your own mini shoots that have nothing to do with the client at all. Basically, “The Falconer” (aka the image I’m sharing all over this post) exists because I was doing a shoot and my dear friend Shelby was there to model, along with one other person. While the client and the other model were in the hair and makeup room getting done up for the next look, Shelby and I were left to our own devices in the studio. The lens flare used is from here. The particles used are from here. So, the moral of the story is to always make sure the client is happy and gets the shots that they think they want, and then provide them with the images they actually need. So long as it doesn’t interrupt, don’t let an opportunity to cram in a mini shoot, even if it doesn’t have any of the client’s actual products in it and is totally for you. Heck if you can swing it, just wait until the clients leave and THEN take your shot. In the case of this image I knew Shelby would be leaving with the client, so it was a now or never opportunity and boy am I pleased I didn’t let it pass me by. Thanks Shelby for always being the sweetest, warmest, kindest, most fun and enthusiastic person to be around. And to everyone else, go out there and get your shot! I hope you all enjoy the little layer breakdown video I’ve provided below for your viewing pleasure.